About me: Dr. Diana Azurdia has been a member of SACNAS for 16 years. She is a Linton-Poodry SACNAS Leadership Institute (2014 LPSI) and a Howard Hughes Medical Institute Advanced Leadership Institute (2016 SACNAS - HHMI ALI) Alumni. Currently, Dr. Azurdia serves on the national SACNAS Board of Directors and as a UCLA Chapter Co-Advisor. Dr. Azurdia leads UCLA’s effort to enhance diversity in the biomedical graduate student population by cultivating a strong inclusive graduate training culture focused on personal wellbeing, professional development, mentorship and leadership. She has directed several programs that broaden participation in science, served as adjunct faculty in the Chemistry & Biochemistry Department at CSU Los Angeles and performed postdoctoral research in the Department of Obstetrics & Gynecology at the UCLA David Geffen School of Medicine, investigating the role of Wnt/betacatenin signaling on histone modification and its role in metastasis and proliferation of triple-negative breast cancer cells. She earned her PhD in Molecular Biology & Biochemistry from UCLA, where she was a NIGMS Predoctoral Fellow (F31), and graduated with a B.S. in Biochemistry from CSU Los Angeles, where she was a NIH MARC trainee and participated in the NSF LSAMP program. Dr. Azurdia is a first-generation Guatemalan-American and the first in her family to attend college. She grew up in a low-income household with very limited resources and her first exposure to the idea that science could be pursued as a career came through the Mathematics Engineering Science Achievement (MESA) program. As the beneficiary of broadening participation programs she believes that initiatives that promote access to STEM degrees are important for equal representation of all identities in science, the creation of innovations that serve all communities and income equity. Consequently, Dr. Azurdia has devoted her career to promoting initiatives that serve those causes. Additionally, she attributes her ability to navigate her academic career to key mentors and therefore a major focus of her work centers on the propagation of effective mentoring of underrepresented individuals in STEM. Research Project: I study mechanisms of gene regulation in yeast. My current project investigates how yeast respond to starvation by using molecular signals on RNA to reallocate resources and promote survival. Many of the genes and processes I study are evolutionarily conserved up to humans, and my work can offer insights into their roles in development and disease. About me: In addition to my research, I have a passion for teaching and outreach. 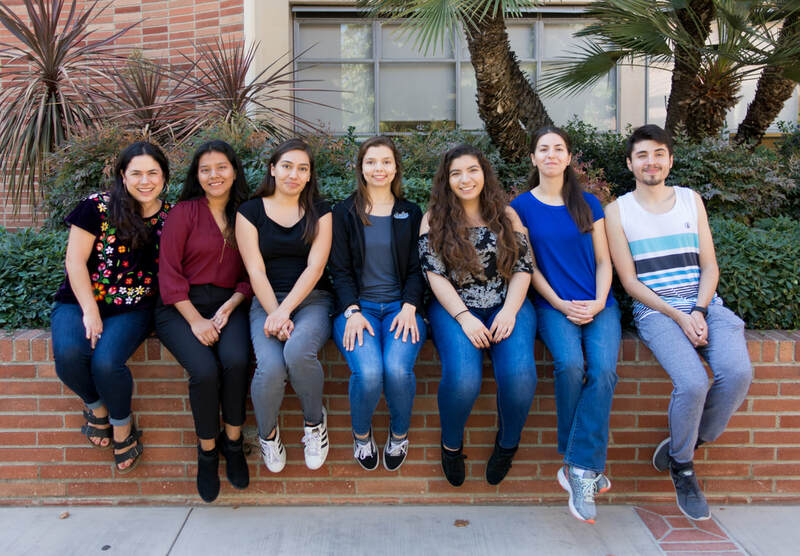 I am a Teaching Assistant for the HHMI Collaborative Undergraduate Research Laboratory and I served as a Co-Outreach Coordinator for SACNAS at UCLA last academic year. Some of my hobbies include playing piano, experimenting with random DIY projects and connecting to nature. I am the first in my family to pursue graduate studies, and the second (after my mother went while I was in elementary school) to go to college. I love networking, mentoring and sharing stories with other resilient scientists. We were inspired by those who came before us, and will be the inspiration for those who come after us. I look forward to leading our team towards accomplishing our goals this year! Research Project: I work in Jose Rodriguez's lab where I study the structure of aggregated proteins commonly known as prions. About me: I grew up in a small town in Indiana and attended Indiana University Bloomington for my undergrad. I have been a SACNAS member for over four years and was also on the board my senior year at IU. As a first-generation student and the first in my family to attend a traditional four year college and receive a bachelors degree, I recognize the importance of effective mentoring and outreach and commit my time to ensure all students receive the same opportunities to allow them to succeed. In my free time I enjoy spending time with my family, my dog and going to the beach! Research Project: I work in the Tracy Johnson Lab where we study RNA Splicing using the model organism Saccharomyces Cerevisiae (Baker's Yeast). My specific project is try and identify the mechanism by which the intron of an mRNA transcript, GCR1, is able to recruit the ribosome to initiate translation within the intron, bypassing the start codon in the first exon. About Me: I grew up in the San Ysidro area of San Diego (few miles away from the border). Growing up I enjoyed both social science and STEM classes but I was definitely more en-captured with trying to understand the science behind how the nature around me worked. This led me apply to UCLA as a MIMG major. Eventually I found my passion for trying to understand the daily life of cells through classes and research seminars that I attended and made the switch to MCDB. Along the way I made my home in various organizations such as SACNAS, Howard Hughes Medical Institute Pathways to Success Program, and CityLab. These orgs not only provided me friendship and mentorship but also the ability to provide the same to undergraduates and younger kids with similar backgrounds to me. My hobbies/interest include soccer, running, video games (variety from FIFA to League of Legends), and politics. My aspirations are to obtain a PH.D and to use that degree to pursue a career in research and teaching (two things I'm very passionate about). Research Project: My research involves understanding the biological role of PRMT7 and the involvement it has with cancer metastasis. Currently, our lab is studying how small molecule inhibitors interact with this enzyme, including SAM binding analogs, peptide inhibitors, and potential bisubstrate molecules. In addition to understanding these compounds and the interactions with PRMT7, my interest also involves understanding the physiological effect of temperature, pH, and ionic conditions on PRMT7 expression and activity. About Me: I grew up in Pacifica, a small coastal town located just 5 minutes south of San Francisco. My motivation to go to a 4 year UC was massive, yet unattainable, due to financial obligations. So instead I went to the next best thing San Francisco State University (SFSU). Here I obtained my Bachelors of Science in Biochemistry, and my Master's of Science in Chemistry with an emphasis in Biochemistry. Although SFSU wasn't initially enjoyable to me in the beginning I've learned to love it by becoming affiliated with campus programs like SACNAS, and the Student Enrichment Opportunities program (SEO). These programs gave me the confidence to be a scientist, while also giving me pride in saying I graduated from SFSU! Some of my greatest accomplishments are obtaining the NIH-RISE and NSF-CCC fellowship, and becoming a 2016-2017 CSU Sally Casanova Scholar. These fellowships have taught me the importance of diversity and inclusivity of underrepresented minorities in STEM. On my free time I love cooking, being a foodie, and also going to the beach! Research Project: I work with Dr. Timu Gallien studying coastal flooding and processes, as well as how these are affected by climate change and sea-level rise. My current research involves investigating the physical mechanisms that control resilience of protective coastal structures and optimizing their design. Research Project: ​I’m an undergraduate researcher in Dr. Erina Vlashi’s lab which is part of the Radiation Oncology Department in the David Geffen School of Medicine. Cancer is known for being resistant to treatments given its ability to rapidly adapt to stress. Furthermore, recent studies show that there is a subpopulation in tumors that are normally in a quiescent state but have the potential to give rise to tumor cells. This subpopulation of cells are known as cancer stem cells. These cells are incredibly resistant to radiation treatment, therefore our lab studies the metabolism of cancer stem cells in order to target this pathway as a method of making cancer stem cells susceptible to radiation treatment. We focus specifically on three types of cancers: triple negative breast cancer, glioblastoma multiforme, and pancreatic cancer; all of which have devastating prognosis due to the lack of effective treatments. Research Project: I am currently working in Dr. William Lowry’s lab. My project focuses on GPCR/CREB signaling pathways to see how they influence hair follicle stem cell behavior. Inflammation can trigger the hair cycle through wound healing. My project focuses more specifically on determining if our drugs are triggering the hair cycle or if it is due to inflammation. I am using immunofluorescence to visualize inflammatory markers and creating a panel to summarize our results. ​About Me: Outside of academics, I enjoy spending time with my family and two dogs. I enjoy baking and watching scary movies and documentaries. I grew up on Eminem and oldies. I like taking pictures and making memories with friends. I also volunteer at Chase Child Life and Family Resource Room at Mattel Children's Hospital. I recently started as an adult literacy tutor under Project Literacy at UCLA. As Co-Social Chair, I want to share all the amazing things we are doing at SACNAS with the rest of the world. It's important that underrepresented students in upcoming generations see people who look like them succeeding in higher education and the STEM field. I hope our impact can inspire others. Research Project: I study gene regulation in yeast in the Tracy Johnson lab. I'm currently investigating auto and cross regulation of ribosomal protein genes. Research Project: I'm using skin cell lines grown from grey wolves to test the potential immune function of a specific gene. Some wolves carry a mutation in this gene that is easy to observe because it also turns their coats black. Wolves with black coats tend to survive disease outbreaks better than grey individuals, so I am specifically investigating if the mutated gene has enhanced immune function. Research Project: I am working under the tutelage of a mentor in the Arispe Lab to define the intimal immune cell population and determining the biological relevance of immune cell accumulation in a non-diseased, aged mouse model. About Me: As a first generation pre-med student at UCLA I feel that it is important to have organizations like SACNAS where we can learn and also teach students, who may lack the mentorship, about the beauty that is science. Throughout my years in high school and to this day I have had great mentors who have advised and guided me into the career path I am pursuing today. I want to be able to give back to the children in my community who may see science as an impossible field to be in, while also working along my peers in UCLA to make this school as inclusive and a supporting campus as possible. My hobbies include Mexican Folklorico and spending time with friends and family.